With the perfect touch of lace, show off your classy side with your love for the country...Mossy Oak Country, that is! 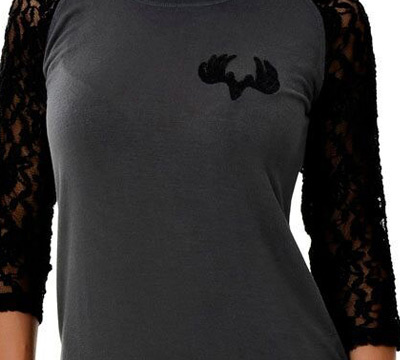 The lace sleeves and buck detail make this top perfect for a night on the town. Features include: Mossy Oak break-up country, high low cut, Boyd: 95% Rayon, 5% spandex, Lace: 92% nylon, and 8% spandex. Made by Girls With Guns®. LIMITED TO STOCK ON HAND. NO BACKORDERS.